Interim results from soil amendment trials underway at the University of Queensland have indicated what many farmers have reported over the years, NatraMin works! While the final report has yet to be delivered, early phases of the replicated trial work have confirmed that NatraMin can assist soil physical properties and boost plant growth while adding value to an important asset – your soil. Here is just a snap shot of some of the data that will no doubt be of interest to anyone on the land. 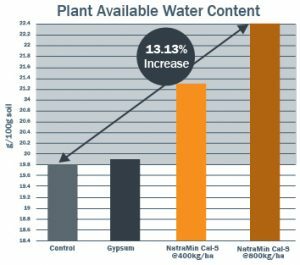 NatraMin Cal-S significantly increased the Plant Available Water Content (PAWC) of the soil as compared to the gypsum treatment and soil that had no amendment applied (control). Plant available water content or available water is the difference between field capacity (commonly referred to as water holding capacity) and permanent wilting point (level where plants can no longer access moisture from the soil). 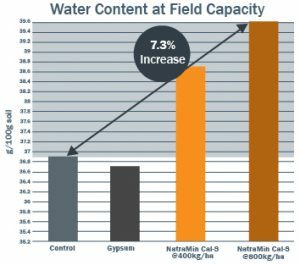 As you can see from the graphs, there is an increase of up to 13.1% PAWC in the soils treated with NatraMin Cal-S and this is as a result of increasing the water content at field capacity or improving the water holding capacity of the soil. 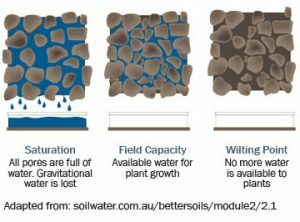 It appears there is an interaction of NatraMin within the soil that improves soil porosity – giving it space to hold more moisture or in other words, increasing the ‘size of the bucket’ within the soil. The bigger the bucket, the more moisture available for plant growth. Plants can ‘hold-on’ longer between rain events in dryland situations – could be the difference in getting a crop off or not. Reduced frequency and/or duration of irrigation (saving time, money and resources). Would a 26% increase in yield interest you? 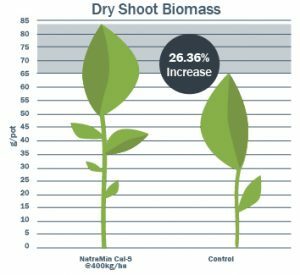 In the same replicated glasshouse trial, plants grown in soil treated with NatraMin Cal-S at 400kg/ha yielded a 26.36% increase in dry shoot biomass as compared to the control (all soils had baseline NPK fertiliser applied as well). This extra growth could be of commercial significance and enhance the returns for farmers and graziers that rely on such production for their livelihood. 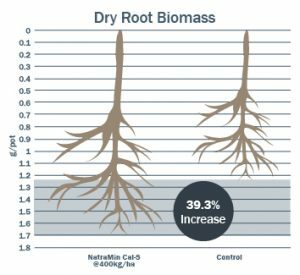 An even more pronounced difference was evident under the soil surface, with the 400kg/ha NatraMin Cal-S treatment recording an increase of over 39% in dry root biomass in comparison to the control soil. Increased root growth has many significant benefits not only for the current plant, but also for on-going soil health. These results indicate that it is not only possible to get a return on investment from applying NatraMin in short term production, but you can be adding long-term value to your asset within the soil at the same time. Soil respiration data captured throughout the trial has also indicated that NatraMin appears to stabilise soil organic carbon and decrease the release of CO₂ from soil. This is obviously very important in today’s environment as maintaining and building soil organic carbon has been linked to many agronomic benefits such as improved soil health and fertility. NatraMin also appeared to play a role in soil pH, particularly in acidic soils. This is even more interesting when considered in conjunction with the reduced CO₂ release from the soil respiration work as unlike using traditional materials such as Lime (Calcium Carbonate) for increasing soil pH which actually releases CO₂, silica-based products such as NatraMin can improve pH without the CO₂ release. Other analyses in terms of nutrient availability, pH buffering and soil structural measurements have produced some positive data to this point in time, particularly given the relatively short timeframe of the trial. 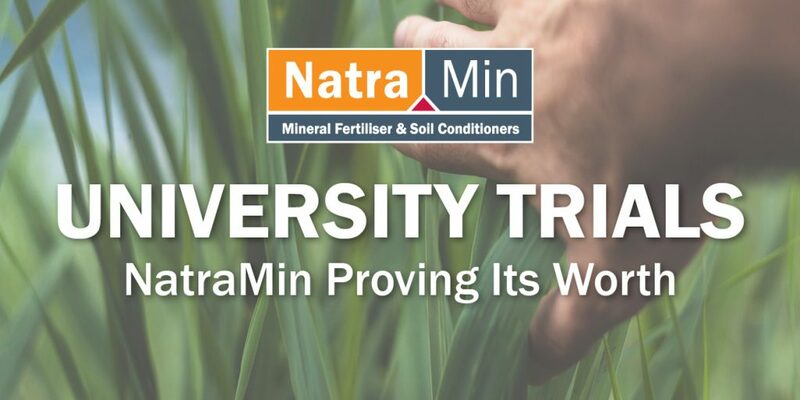 These initial results have sparked great interest and further research is now under way to investigate how NatraMin may assist in these areas and help you get the most out of your soil. Keep an eye out in future editions of ‘Over the Fence’ or check out our website and Facebook pages for updates. For further information, please contact AgSolutions® on 1800 81 57 57. Do You Have An Emergency Plan In Place For Your Horses?